A real family, struggling with a history of breast cancer provides the back story for this compelling lesson on genetic testing in the Bio-ITEST Genetic Testing curriculum strand. We recently updated lesson 5 for students using Molecule World. This video shows how we used the Molecule World iPad app to locate a mutation site and see how the cancer-causing mutation affects the BRCA1 protein. In the video, we used molecule coloring to show how a portion of the BRCA1 protein interacts with another protein, CtIP. This interaction is important in allowing the BRCA1 protein to repair damaged DNA. The video shows where CtIP binds to BRCA1. We examined a pair of proteins that are positioned in similar orientations, 1JNX and 1N5O. 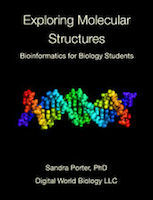 You can download these structures from our BRCA1 structure collection and view them in Molecule World. The video shows how we scroll to find PDB position 1775 in 1JNX, select the methionine, and show the side chain, and change the drawing style to Ball & Stick. Then, we do the same thing with the protein that contains the cancer-causing mutation. In this case, the amino acid at position 1775 is an arginine. Since the proteins are oriented in the same direction and positioned in the same way, we can alternate between them and see how the structure changes between the normal and mutant form. This shows us how the mutant amino acid blocks the interaction with the CtIP, making it harder to repair damaged DNA. Look at all the Bio-ITEST Genetic Testing Curriculum.